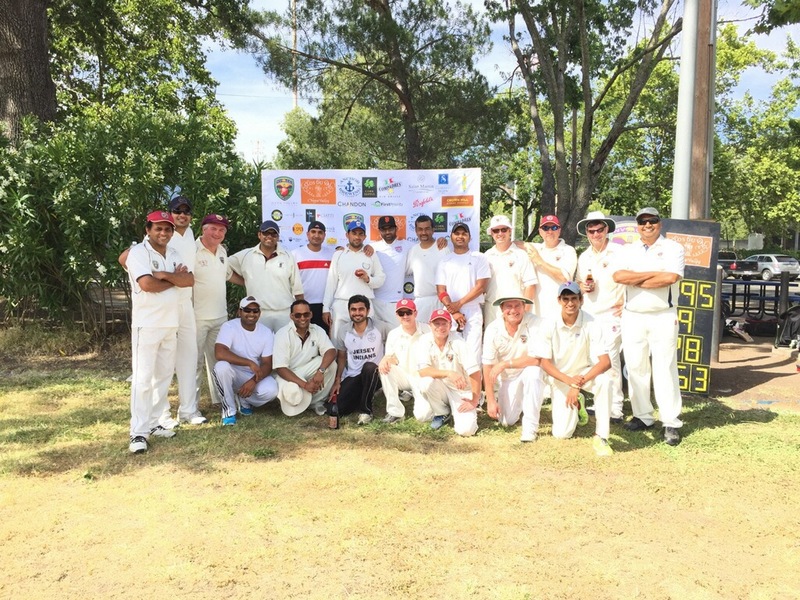 The Sonoma Gullies put on an impressive display of “total cricket” recently as they beat NVCC in a convincing display at The Fairgrounds in Calistoga. There were highlights for the NVCC but they were out-gunned in all three departments – batting, bowling and fielding – by the Gullies who took advantage of some questionable decisions that went their way. NVCC captain Rob Bolch won the toss and decided to try and take advantage of cloudy overhead condition by putting Sonoma into bat. Bolch’s decision paid early dividends with two early wickets for the New Zealand pair of Martin Mackenzie and Bernie Peacock with only 15 runs on the board for the Gullies. The tables tuned with the arrival of the Gullies number four batsman Sushil Kumar to the crease. A formidable batsmen and well known to the NVCC attack Kumar (53) was the anchor in third wicket partnership with Ishan Patel (35) that totaled 85 runs. NVCC had their chance to get Kumar second ball when a tough chance to catch him off a slight edge was almost taken by NVCC wicket-keeper Phil Bourke. The NVCC were lively in the field with some strong ground fielding on display from Bill Nancarrow, Clive Richardson, and Dave Aquilina but this was not enough to thwart the Gullies batsmen who scored 184 of their 253 runs with boundaries (19 fours and 18 sixes). The Gullies batted all the way down their order and despite NVCC taking wickets at regular intervals eight of the Sonoma batsmen scored runs in double figures with five of them scoring in excess of 20. The pick of the bowlers for NVCC was Kiranpreet Singh whose 6 overs gave up only 17 runs and included the prize wicket of Kumar who made his 53 runs off only 26 balls that included seven 6’s. 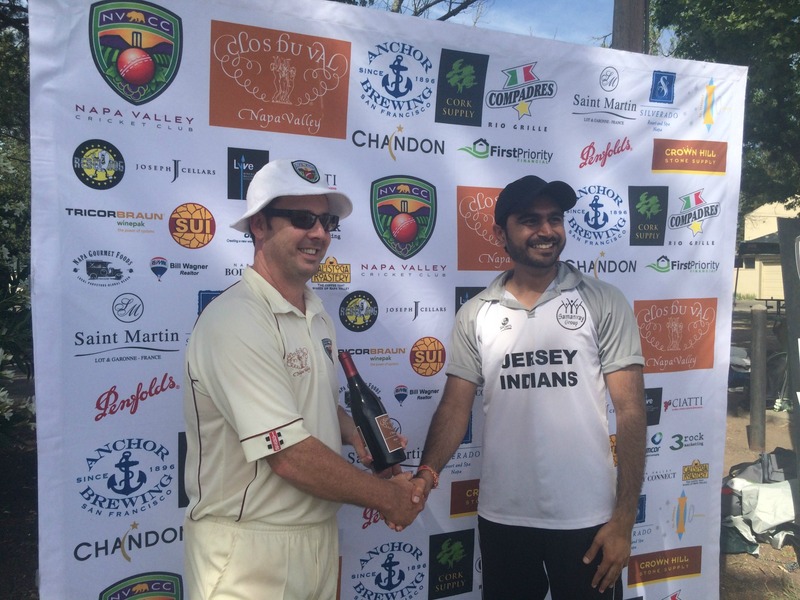 The NVCC showed their bowling depth with six of the seven bowlers used each notching up wickets with two apiece for Singh, Mackenzie, Bolch, Bijoy Ojha and Andrew Healy. After the lunch break NVCC set off to chase what would have been the biggest chase in the clubs history needing 254 runs to win in their allotted 35 overs. Even more intriguing was the fact that games between the two teams are traditionally low scoring affairs so a successful NVCC chase would have seen records tumbling. The Gullies tradition of tight and consistent bowling continued and was to frustrate many of the NVCC batsmen and ultimately lead to wickets. NVCC never really got going with the bat and top scores of 20 from Mackenzie and 11 from Healy were as good as it got with the bat on a frustrating day at the crease for NVCC. The 19th over was the nail in the coffin for NVCC with two run-outs and a wicket for Nadeem Solanki in five balls. The pressure of the line and length bowling from the Gullies told as the NVCC looked to run where there weren’t runs to be had and some fine ground fielding from the Gullies with two direct hits. NVCC were looking to put some semblance of respectability on the scoreboard with a reply in three figures but fell just short of this ending up with 95 runs on the board in the 29th over. The traditional Clos du Val “Man of the Match” Award was presented by NVCC Club Captain Rob Bolch to Ishan Patel of the Sonoma Gullies for his all-round performance on the day. Fittingly Bolch presented Patel with a bottle of Carneros Pinot Noir with the Carneros region traversing the county line between Napa and Sonoma counties! Napa Valley CC Batting – Martin Mackenzie 20 runs off 20 balls (4 x 4), Andrew Healy 11 off 29 (2 x 4), Bernie Peacock 10 off 25 (1 x 4). 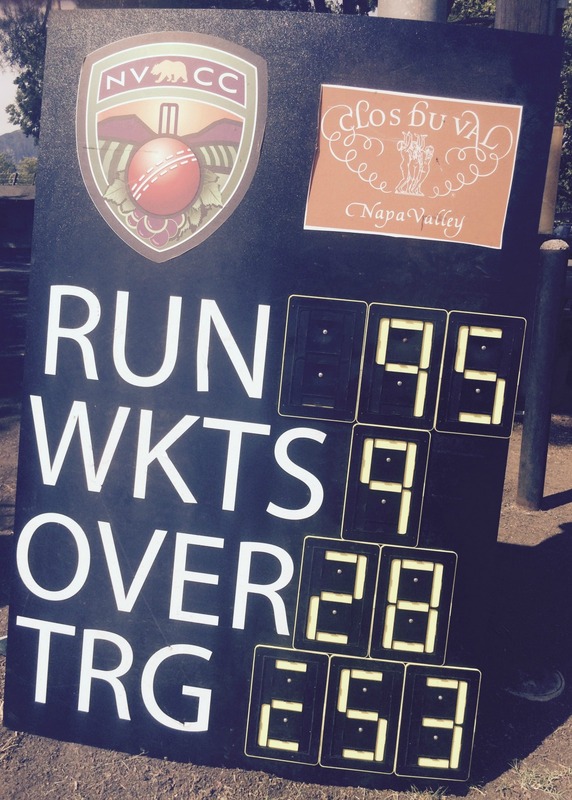 Napa Valley CC Bowling – Kiranpreet Singh 2 wickets for 17 runs off 6 overs incl. 1 maiden, Rob Bolch 2 for 45 off 6 incl. 1, Martin Mackenzie 2 for 45 off 6.